NEW YORK, N.Y., June 7, 2011 (SEND2PRESS NEWSWIRE) — In some of the top cities in United States the underlying unemployment problem shows the impact on homeowners that face foreclosures, despite government programs to help hundreds of thousands nationwide keep their homes. 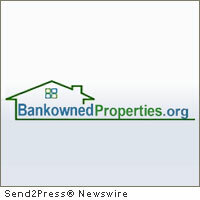 According to http://BankOwnedProperties.org, the foreclosure listings showed both drops and rises in the states of New Jersey and New York. In April, there were 361 bank foreclosures in New York State and 372 bank foreclosures in May; a small rise at +3.05 percent. But there were 468 bank foreclosures in New Jersey State in April and 357 bank foreclosures in May; a huge drop at -23.72 percent. Usually, real estate trends continue for a long time, and then change only after some major reason that changes the circumstances. Even though government intervention has been available to help homeowners avoid increasing mortgage defaults and risk losing their homes, many homeowners have not pursued the assistance available to them for lack of hope to qualify, be approved for assistance, or recovering from the loss. There are suspicions about being able to meet the requirements of actually receiving help through various government programs. Real estate investors are currently buying up foreclosures and turning them into rentals. In some metro areas, for example, where 30 to 40 percent of all occupied homes are rentals. Because so many people have been burned by the housing collapse in recent years, the rental market may remain very active for years. Although some of the larger cities in New York show drops in listings, statewide the foreclosures actually increased as many of the foreclosure processes have completed and the paperwork finalized. In previous months banks and lenders were under pressure to ensure that the foreclosure filings were accurately processed causing a moratorium to be placed on completing the processes until everything was confirmed correct. Now that the process has completed more homes may be placed into foreclosure in the months and years ahead as the processes are once again continuing. Original Keywords: Bank Owned Properties, foreclosure listings, REO, property, homes, real estate, NY state, NJ, lists, internet, online, bank foreclosures in New York BankOwnedProperties.org New York New York NEW YORK, N.Y.
REFERENCES: Internet and Websites News, Bank Owned Properties, foreclosure listings, REO, property, homes, real estate, NY state, NJ, lists, internet, online, bank foreclosures in New York BankOwnedProperties.org New York New York NEW YORK, N.Y.